I can perform all the economic analysis in the world, and it won’t convey the sheer apprehension I feel about China’s current situation anywhere near as well as the following pictures, found on ChinaSmack. For the last several months, I’ve been just waiting for the moment when somebody rolls up a big wad of 100 Renminbi notes into a cigar, sticks it in their mouth, and lights up. In the meantime, I’m going to have to settle for this as the next best thing. So that’s (one factor) why medicines are so expensive for ordinary folk in China. I guess, when poor folk get sick, the bosses at Harbin Pharma will just utter, “let them eat cake” ! 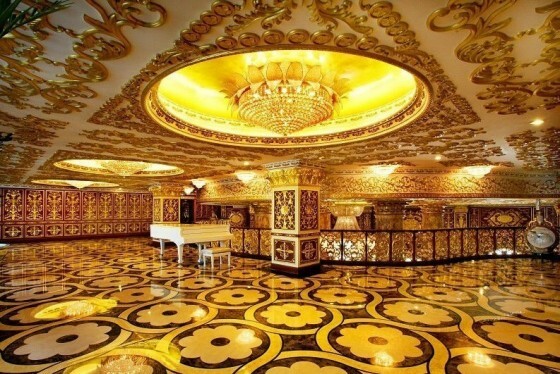 Wow…..I thought the Bolshoi renovation was extravagant (though worth while from the stance of preserving culture) but that’s nothing compared to this. Thank God the Harbin building doesn’t look like all those other cookie cutter office buildings and office parks all over the world, so that you have no idea what country or culture a building is located in when you see a photograph. I say, bravo to Harbin! Has anyone seen the castles of England and France? Why not China? You are more right than you realize. While this is more garish than elegant, at least they are trying. I do not understand the objection to using wealth to create beauty. If anything is harmless and sustainable as an indulgence, it is decorative art. What is wealth for, again? Is there some modern ethical compulsion to unrelentingly utilitarian brute-force design? Did you know that the philosphical roots of modern minimalism were communist? I do agree that China is making some bad decisions. Yet I don’t see this sort of thing as part of it, except for hoping that they do a better job of it in future. Severe minimalism came out of the Bauhaus movement in Germany last century and influenced most of the world except the CCCP. Read Tom Wolfe’s “From Bauhaus to Our House”. I agree that China is being economically insane (in much the same way as everybody else if perhaps more so, but that’s another story). I just don’t agree that an attempt, however childish, to revive the decorative arts in corporate or public spaces is a bad idea. I feel pretty strongly that it isn’t. As for your term “decorative”, we’ll just have to respectfully agree to disagree both esthetically and in terms of the burden on shareholders. I agree that it’s an aesthetic failure. I’m just claiming it’s an attempt, and that’s a good thing, regardless of other bizarre errors the Chinese are making. And I can already tell that we disagree about the role of the corporation in society; I do not think shareholders are the only legitimate stakeholders. That all said I am glad I stumbled across this site and will be following with interest. Mr. Tobis, the problem here is not a matter of aesthetics. It is a matter of a nationally-owned enterprise spending what is essentially the people’s money (not that of private investors) on a capital expense that does nothing to raise the value of the enterprise, all while pumping acre-feet of toxic sludge into an aquifer on which tens of millions depend for drinking water. Garish is fine, but spend your money on environmental protection, R&D, and benefits for all employees before indulging in corporate ego-inflation. You may not be outraged, but I assure you the people of China – the company’s customers – are. Give me a break Mr.Wolf. As if corporate America makes this a priority. Who’s speaking about USA as a model ? As a matter of fact USA is considering Florida’s birds better than Bhopal’s children. There is just no hope to see USA improve itself on such issues, before its fall. the later would be the better, of course. China is still climbing, and they are learning. Brings to mind the scene where Gordon Ghecko’s upwardly mobile sidekick moves into the new apartment after the decorators have stapled the gilt to the walls and ceiling. There is Chinese quality bricks and mortar work behind the surface glitter. This is a metaphor for most of the recently constructed infrastructure. I notice it has been pulled down on China Smack I also notice that investors have lost 57 percent on their shares this year. This explains one reason why. P.S. Thanks also for your fine postings on Alpha. Actually, the quote from Louis XV is “Après moi, le dèluge”. But you’re point is well-taken. No problem. I bet you to go in 5 years to see the probably crappy situation of the building. They build things that afterwards they are unable to keep in shape, even evident ones -clean/repaired floors/walls, windows, stairs, elevators… imagine for the not so evident (safety equipment, plumbing, wiring…). In 15 years they will demolish it and build a new one again. Who said fear? Stunning, not the palatial opulence, but the defenders thereof. Perhaps, they be or want to be them that walk the beautiful golf courses of Beijing, swinging clubs amidst the splendor of green grass, contemplating whether they have the time to visit the car-wash establishment down the way. China is also building ghost cities that will remain uninhabited because the people can’t afford to live there. Total insanity. A housing bubble of epic proportions. I can totally see crackheads squatting this place in a couple years, after it hits the fan and comes crashing back to earth. The hard limit on China’s growth is running out of energy supplies. Until then, no problem!! Oh, and Wayne, monarchs always call themselves “we” and “us”. Although there is a school of thought which suggests the comment was made by Mme Pompadour to Louis XV after the battle of Rossbach, and not by Louis himself. Now that I revisit that post, I have no idea why the attempt at the quote. I really shouldn’t post when high. But in the meantime the US still holds first prize for energy glutton. The USA uses about 21% of the world’s oil (we are a net exporter of coal and gas) while producing 28% of the world’s GDP. Obama hasn’t managed to completely destroy us yet. I’ve yet to hear of anyone lighting up a cigar made of 100 RMB notes, but earlier this year some guy (coalmine owner, of course) took a sledge hammer to his Lamborghini after receiving what he felt to be poor service from the dealer. Surely the cigar guy can’t be too far behind. Wow! Looks like Michelle-Marie Antointte Obama now has another place to rent our for her and all her cronies on the taxpayers’ dime. Professor, I hope you will delete political partisanship from an otherwise thoughtful board. I didn’t know Donald Trump decorated any buildings outside of the United States. All this represents is the immense wealth transfer currently taking place; the wealth is being transferred from the West to the East. The United States is the largest debtor nation in the history of the world; its Western European counterparts are just as broke without any recourse. At somepoint the Chinese will wise up and dump all of these U.S. Treasuries as they move from a model of export to a model of internal consumption. We are living in the decline of the West. In my view, this century belongs to the East especially China. If your observation is true then it seems that they have learned nothing from watching the climb then decline of those that went before. Of course they wouldn’t be the first to be guilty of that. Nonsense. China buys US Treasuries as a necessary function of its trade policy. No treasuries = wage arbitrage collapse = most of China becomes re-unemployed in short order. No more “farms to factories” fictional GDP… You don’t turn a rural farmer into a neurosurgeon or electrical engineer overnight. What can you/they do? Same thing we did in the US…literally explode the country with low-skill construction and (in our case) mortgage broker jobs… At some point the whole country will be covered in concrete and rebar. Then what? What is China going to do for revenue as the “opulent” Westerners who developed the technology they routinely steal go into austerity mode and finally decide they don’t need to replace their TV every 9 months or own 57 pairs of jeans? Internal consumption?! Have you ever actually BEEN to China?? Do you people know that the kingom of heaven is at hand God is coming back but Sation is all ready here look around you people we better be ready become it is going to happy if you are ready are not I am waiting for Jesus not man because all these thing are nice do not get me wrong I like nice thing sometime but it can not save my soul. God Bless! Love it. Better than some horrid minimalist box. Bet the staff love working there. Probably made a few craftsmen rich as well. Yeah! Go for it China! I imagine the people that you call staff, are not allowed in the board room unless they are serving food or cleaning up afterward. The first picture look to the left wall is that a picture of the “Last Supper’? It looks as though they are investing in artwork too. as nothing more than rationlized emotional reactions! Gee I wonder how the Chinese got all their money? The answer is at your local Wal-Mart. I happen to love the floors !! Ahhhh, it’s at once beautiful, and appallingly garish…I once read Pearl Buck’s iconic book, “The Good Earth.” Although the Boxer Rebellion was caused by resentment against, foreign imperialism and other causes, the basic tenants of that rebellion, and many which occured before, were the same-Those who oppress the poor will pay, and pay dearly, and the poor most of all. It’s a waste of the shareholders’ money. Man, if I ever needed another reason NOT TO INVEST in any China company, this is definitely it. What a total waste of money that should be better spent on workers wages, health and safety, upgrading of manufacturing equipment etc. The individuals that thought this up would be right at home in Washington D.C.. This is a manifestation of an old Chinese culture-” face boasting ” brought to the extreme, except this time, on the public’s expense. Ego rules in China, whomever can flaunt their wealth, do it in the most lavish ways, sometimes in odd style from a western perspective. This article is only one example of how government spreads their wealth to the lower classes, construction and development is everywhere, in every imaginable form, art, infrastructure, energy, some projects make money and some boost ego. Do you think the subcontracts were given out to western countries?? No!! Chinese nationals are so pacific in their daily lives they cant be bothered by these government spending sprees, they are too busy trying to get a piece of the growth, in return being able to buy a Volkswagen or Buick and boosting their own ego. Less than 30 years ago China’s government officials and it’s people had a rough time, there were no Audi, BMW , smooth highways nor domestic air routes to run the country, many politicians rode the hard seat trains to Beijing and ate the lunch prepared in their concrete block house somewhere in the remote vastness of China. “In Japan, in 1986, the value of the nation’s real estate doubled in a single year—and doubled again the next year. Japan was the world’s largest creditor, holding thirty per cent of U.S. debt, and was home to the world’s ten largest banks, with a stock exchange bigger than Wall Street. A hundred square feet in downtown Tokyo was selling for a million dollars. Soon, the buying spree went global: first real estate, then banks and resorts and Hollywood studios. They picked up Pebble Beach, Rockefeller Center, and Columbia Pictures. “Japan Invades Hollywood,” was the cover of a Newsweek, with the Columbia Pictures statue draped in a kimono. Defying gravity is the thing that comes to mind. Do we think the Chinese are smarter than the Japanese that they can steer clear of the downdraft when all that overinvestment comes crashing down in the form of problem loans for the Banks? Reminds me of drunken sailors on shore leave. If I look at things like this….it just makes me sad….poo chinese…. Wait until you see the residences of some corrupt politicians in Malaysia. Humans will be humans…there is no such thing as communists…monopoly is the game in town…once you have it you can flaunt it. 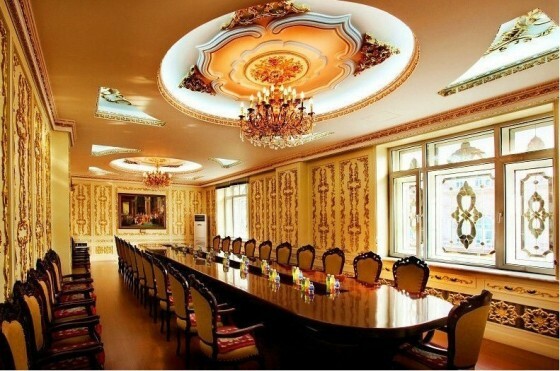 Better spend it on luxurious things than guns and bullets like some other nations…this halls looks like a fine dinning restaurant to me…perhaps they are. I hope they serve good rast duck. This is a sample of what monies coming China’s last decade manufacturing and commercial boom can make. If the FED prints tons of dollars to keep the enormous and unsustainable public and private machine the US has become, then why China cannot do outrageous things? They’re actually in a more legitimate position to do so, considering the huge reserves of those ridiculous papers called fed notes they have. Not to mention they’re one of the largest creditors of the US (1st place the FED). I’d rather say they’d be stupid not to use all these unreal wealth in building super highways, hi-speed transportation systems, bridges you can hardly imagine and whatever they want before all those papers become useless. No wonder why they’re trying to buy all the freaking gold in the world. It doesn’t cost as much as you’d think to design like this in China. The marble is local and skilled artisans don’t earn much. 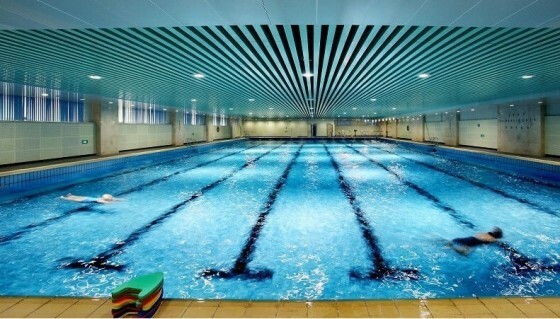 It’s beautiful, and great Feng Shui which should contribute to company profits. And I’ve had medical treatment in China….I much prefer both the treatment and the cost to the US. I think you are right. It is first of all ugly, and, typically, being ugly it is also completely devoid of China’s own past. I am sorry and surprised to see that they imitate the worst of Europe. what i’d love about it is the hall of mirror..
such a historical place.. je l’aime tellement! Yes, this structure is rather garrish. But it is the same kind of building that is all over Europe and America. Buildings that are the expression of exploited labor and violated human rights; the healthy growth of business is always the deterioration of life. You will NEVER find ANYTHING like this in the US. You probably haven’t ever even been here — you just believe whatever BS you’ve made up in your head. Compared to this sort of obscenity, the White House is a hovel by comparison — and after we kick its cyclical inhabitants out of it after a couple years of their bumbling jackassery, they’re on their own for housing. I prefer it that way. The only places in Europe and elsewhere where you will find this kind of revolting buildings are places that fell apart from revolution and recreated themselves WITHOUT things like this. Versailles, the Hermitage … remember how their inhabitants ended up? Go ahead, China. Fail to learn from Europe’s mistakes … the guillotines are patient, and they will be waiting for your robber barons, just like they waited for King Louis and the tsars. May the US NEVER be degraded by this sort of over-the-top inhumane garbage. Kind of reminds me of big car companies in the U.S. Their CEO’s getting paid millions in severance packages for leaving a company behind that they utterly ruined while we all float the bill. Corporations are shameless and greedy. It looks so pretty!! the Chinese are really talented! OS CHINESES SÃO MUITO CRIATIVOS! CREIO QUE MUITO DA MINHA ORGANIZAÇÃO SE DEVE A DESCENDÊNCIA CHINESA DE MEUS ANTEPASSADOS! Hurts my eyes the place is so elaborate. Yeah, this is consumerism at it’s most rampant. Of course, it could be worse (or better?) – they could’ve constructed the thing in the shape of a giant mecha modeled to rip off Gundam or Macross or something. They’ve already done the plagiarism, and it’s only a short time until they make even crazier megaconstructions. Uh…I think labor is pretty cheap in China. I agree the aesthetics of this place are gross, but one man’s kitsch is another man’s living room. 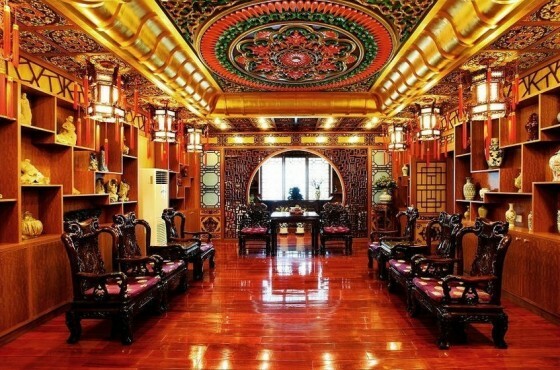 Why don’t they extend the glorious tradition of Chinese decorative arts? Because they are philistines, as are many rich capitalists. Just because they don’t like post-modern or 30s modern, doesn’t make them that different. I wonder how much all this stuff cost? Quite possibly, it’s mostly junk. It might not have added much to the cost of the building. At least not compared to what swank corporations spend on their upscale furniture and other accessories. Before you get all superior and angry, why not look into the actual construction cost? As far as their attitude, clearly they are attempting to make a statement: Mr. Western Capitalist Tycoon – we have arrived! And we will beat you at your game! 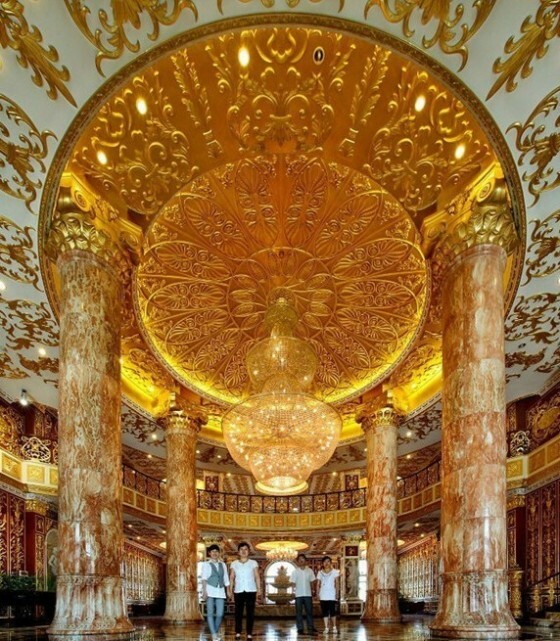 This is certainly an ostentatious display of excessive opulence. Yet, it differs little over the history of mankind as a marker between the haves and have-nots. How does this differ from the Cathédrale Notre-Dame de Paris, or perhaps Buckingham Palace? Were there no poor people then when these monolithic structures were built? Should the funds to construct these have been used instead to ameliorate the suffering of the impoverished? If so, how would that have changed the world as it relates to the human condition? This display is nothing more than yet another display of wealth and power, one in a long, long line of similar displays over the course of our history. In the future, some may look to this as symbolic of the resurgence of yet another golden age of China, and smile with sentimental, if distorted memories. Wow! Crazy! I’m sharing this w/ my friends on FB. Crazy. “Healthy development of a business?” I’d like to know about the healthy development of the workaday employees in this business — what are their working conditions, how they’re treated by management, their reaction to the sight of such an opulent corporate headquarters, etc. And this is the home office of a DRUG company?! It has been this way for centuries; a few with great wealth demonstrating their power amidst a sea of poetry. So what else is new. Man has progressed very little in having a loving spirit from an animal that came out of a dark cave. Congrads on being chosen for FP, great pictures. Well, it is rather exquisite. Well well, dear Mr. Professor, what can we say? Can’t you ever predict, the desastruous consequences of the China’s immorality and policy of the ‘collectivity and group’,very related to the Marxism and the Hebrew tradition of ‘kibutz’, which destroyed the moral of the brightest minds, in the shortest time? Ou sont les neiges d’antant?je vous demand..To the seaside, they’ve been, a few days ago, into a ‘pizza’ restaurant, i guess. Or, maybe, they are located in the monarchies…maybe. In other terms, the evil does not last for long. It is not only me to predict the collapse of China, besides that of the Communist regimes around the world. The Chinese money won’t last for long, not even within China, as well. Our only hope for the healing of the West Side of the Globe, is to become what we’ve been taught to become: ambitious, moral, both peaceful and Extreme/Liberal or Extreme/Right. Do it right or die!It’s only your choice and responsability to be a healthy normal being, indeed.No credit for China and perversities like in the Muslim world and even the U.S. and the U.K., from me. I only fight for and prefer the best from the normal or common state of the(Western) world.Thank you a lot. I spent a month in China this summer. The Chinese people themselves are being very careful with their money, unlike most Americans. The corporations that I visited, through the eyes of the fathers of my students, are very concerned for their employees. What I saw in China was the best of capitalism. The Chinese have a flat tax, and very few regulations on business that crushes entreprenuership. Their children are tested between school changes. The ones that test better go to better schools. That breeds competition and wanting to better yourself. My country used to be that way. My country used to have a flat tax where everyone paid their fair share for the defense of our country. My country used to create businesses. My country used to provoke children to compete. Today in my country, I read blogs denigrating corporations that create jobs (see above). This tells me that even the populace has been poisoned by the socialist agenda that has crept into our country in stages since the days of FDR. We have a tax structure where almost 50 percent of the population pays no income tax and the rest of us pay for them. We have an education system where no child is left behind, so there is no need to compete. Teachers are forced to teach to the slower students taking time away from the stronger students who could create the next great thing, or start a business that could employ the slower student later in life. The situation in my country today reminds me of the Cultural Revolution in Communist China in 1967. Mao had messed up by creating a famine with his crazy policies, so he diverted the anger the people had against him, against the bourgeouis. It seems we are headed toward a famine of sorts in my country and the political elite have been very successful at diverting the attention of the ‘common’ people toward successful corporations and the rich. It has been amazing to watch the transition China has made to a capitalist country and sad to watch the transition my country (the United States) has made to a socialist country. The string of comments above has shown there are still a few true Americans left, but most have been socialized by government schools and “progressive” politicians. Hmm, a 17% VAT tax on everything (13% on some foodstuffs) is very regressive. It’s even worse because there are no social services in China, so poor folks who have to pay 17% tax on things like vegetables. I guess you would consider this fair. Normal in what way? The business I work at doesn’t have gilded anything that I know of, and it’s been around for more than a century. They’ve caught flak for buying art works for their offices, but it surely beats blank white walls. This is Chinese Baroque and Rococo art. 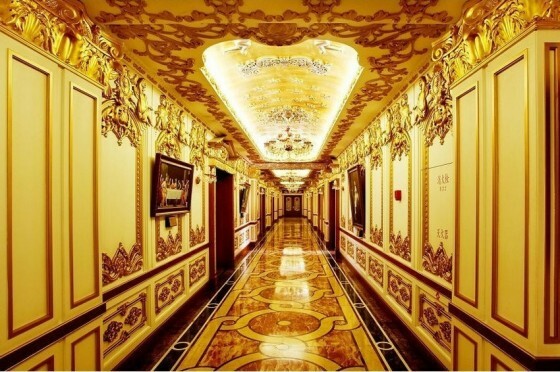 The Chinese have a tradition of “excessive” and complex decoration, (matter of taste). Aesthetically, as an artist, I find the design lavish, exquisite, if a little overpowering. Garish is judging it from a Western perspective, only one of the many around the world. As for the cost overindulgence, enough said. as much as I would love to criticize, I just can’t get over how beautiful it is. I am used to tacky China, but they have officially graduated back into gorgeous. nice work. This is only one of a find… if you really look around you will find many more of these buildings. The country is reacting exactly as expected when it receives so much money that it doesn’t know what to do with it all. Or search Youtube for ” The New South China Mall…build it and they WON’T…”, by EconCat88. China is building ghost cities to keep the GDP value lofty. It will end badly for China, and for the world too. So what; a Chinese parastatal has gotten a little cowboy with its exchequer! BIG DEAL. what about the greedy, UN-checked, scrupulous spending of Western corporations and governments that have gotten us into this Current Economic mess post 2008? Who ever thought of this idea was brilliant!….The Chinese used US$ to purchase all that stuff and what better to do with worthless US$, than lock it into stuff which they purchased in the USA?…..Also a great place to store wealth…All locked into the building….Great security at no additional cost….. Sorry guys….China 10 – USA Nil !!!!! not sure of the actual costs. some of this is very functional eg the swimming pool is not particularly excessive if there are say 10,000 employees on site. compared to offering US employees gym memberships on the same scale, probably cheaper to build your own pool and basketball court, weight room, etc. compare this to salaries for CEO and next few tiers down in a huge US pharma co. i don’t like the excess, but i prefer the chinese version. I prefer the literal translation of that quote, “After us, the deluge”. Today they spend like profligates; tomorrow, their children wail in impoverished despair. What is so grating about this is that it’s a state run company. So, this is built on the backs of taxpayers, not shareholders. If Microsoft wants to build a ship made of gold, that’s great. But if the US government decided to do so, I think the response would be different. Who was the government official that said “yes, it’s good to build a medicine factory that looks like Versailles”? 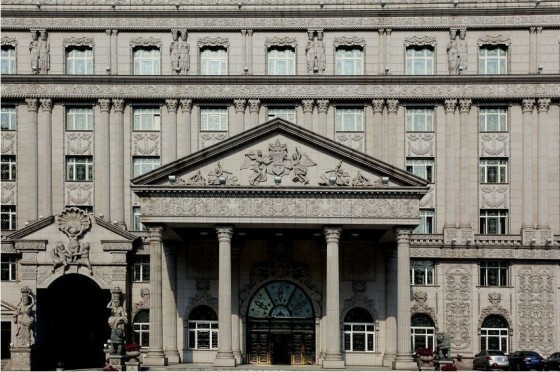 In terms of aesthetic quality, I still think it’s very sad that Chinese designers are more apt to follow 1920s garish Western style instead of their own 2000 years of beautiful architecture. Oh my god. This has to be one of the most obscenely decandent displays ever. I thought that the inside looks like the Las Vegas School of Architecture, but my own personal taste runs more to Craftsman Style architecture. Funny how many commented on the economic issues and yes, a Communist country doing this kind of cracks me up. 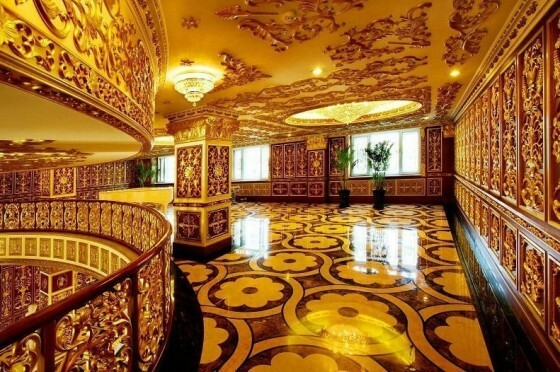 Good taste, bad taste, over the top, garish, amazing…. it’s not a McMansion at least! The Hermitage I understand used to be an insurance company office. Or is that the KGB building I’m thinking of? Everyone is entitled to their own personal taste, but I think that as far as a corporation goes, you simply do not see this kind of stuff here in the US. The stockholders would scream too loudly. I think that the last none Bauhaus buildings built for a corporation might have been the Johnson & Johnson home offices by FL Wright. I know that there was a lot of screaming and yelling over Wright’s Marin County Civic Center in the USA ‘wasting’ all that public money on that building, but can anyone name any other Civic Center in the US that has as memorable and as unique a style as that building? As far as civic architecture goes, how many buildings here in the US are anything besides Greek Revival or Boring Glass Box? “all hell’s gonna break loose” – Finance news simplified.